Waxed floors are absolutely stunning. But before it gets to that, a tremendous amount of waxing and buffing is done. While the results are heavenly, not everyone is willing to go through hell to scrub and wax and buff for hours. Concrete Polishing is an easier alternative. It provides a smoothness and shine that requires minimal maintenance. Polished concrete is acquired through a sanding process that involves a grinding equipment and several abrasive pads. It grinds off the surface of the concrete, removing worn-out finishes and imperfections until it becomes shiny and smooth. The surface stays that way even without waxing. Property owners would surely be happy to know that they can make do with the concrete that they already have and transform it into something stunning and functional. Step 1: The first grinding session involves the use of the coarsest abrasive pad. This will remove worn-out finishes or coatings at the top of the slab. Step 2: The coarse abrasive pad is replaced by pads with finer grits and then a finer one, gradually until the desired shine and smoothness is acquired. Step 3: For a dry method, the dust is vacuumed and cleaned off of the surface. For a wet one, the sludge is collected and properly disposed of. Step 4: The polished floor is cleaned and a layer of sealer is applied to finish it. This protects the slab, seals off the pores, and keeps dirt and moisture on the surface. The polished slab can also stained if you prefer a more decorative look than the utilitarian gray that concrete is. Recreate your concrete floors today. 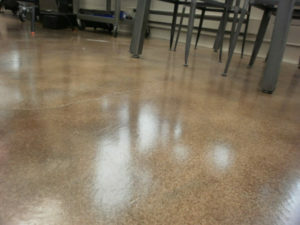 Call (773)377-8976 for top polished concrete services. If the concrete surfaces around you are not as pleasant as you would want them to be, Chicago Concrete Resurfacing can help turn that around. Using what you have now, we can make your home or business space more impressive, both in form and function. With over 20 years in the business, we have the right skillset to provide you with durable and stunning polished floors, unlike anything you’ve seen and walk on before. What are you waiting for? Call now for a free consultation and quote!